There is a current revival of Black Consciousness in South Africa, as political and student movements reconfigure the continued struggle for socio-economic revolution with this ideology at the forefront. There is a current revival of Black Consciousness in South Africa, as political and student movements – as well as academics and campaigners working in decolonisation – reconfigure the continued struggle for socio-economic revolution with this ideology at the forefront. Black Consciousness is also increasingly finding solidarity with similar movements around the world, in particular #BlackLivesMatter in the United States and the black power campaign gaining momentum around the memory of the Mangrove Nine in the United Kingdom. Yet there is still not enough known about the history of Black Consciousness in South Africa, nor its particular solidarity in other parts of the world. 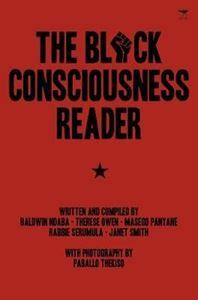 Finding itself at the centre of decolonisation debates and renewed struggles for socio-economic power in the year of the 40th anniversary of Biko’s murder, The Black Consciousness Reader is an essential collection of history, interviews and opinions about the philosophy being revived to finally bring revolution to South Africa. This would be not so much a violent overthrow as a deep change to a nation’s thinking to properly acknowledge its Blackness, and through that its entire past, a broader sweep of its heroes and a wider understanding of its intellectual and political influences. Although Biko would be the most influential personality throughout this history, the book intends to trace the history of Black Consciousness in South Africa also through its other primary personalities and events in politics – predominantly black and woman power – as well as art and music. Steve Biko, Onkgopotse Tiro, Deborah Matshoba, Don Mattera, Neville Alexander, Florence Ribeiro, the Black Power solidarity movement, Rick Turner, Strini Moodley, the lyrical work of Lefifi Tladi and Dashiki are among the many subjects included in this important work.